I know I just celebrated my fall home tour, but things are already changing around here. I am turning my home spooky and perfect for Halloween. There are so many great crafts to make for this holiday, all that are pretty simple. 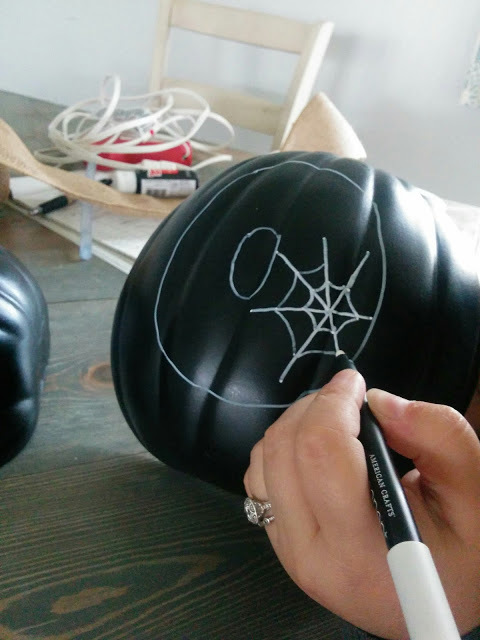 I actually am sharing another group of bloggers and their Halloween crafts. I have been hosting a Instagram challenge for the past few weeks with different themes. Myself, the other bloggers and anyone wanting to jump in can share pictures pertaining to the specific themes. It is such a fun way to get to know other people who get all crazy and fan girl with home decor. follow me on Instagram to get up to date on the fun happenings going on. Here is my Instagram. You will get to see the other ideas that my blogging friends came up with at the end of this post. Here is my supplies for this project. 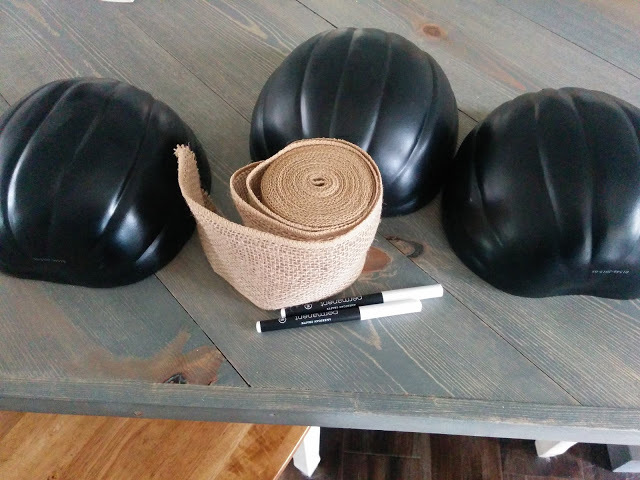 I purchased these flat black pumpkins from Michaels craft store. really the only other thing that is needed is the chalkboard markers. Also some hot glue. I wrote the word BOO on the pumpkins. I was worried the letters were going to be badly shaped, doing anything freehand makes me nervous. It did not help that I had Nora breathing over my shoulder saying “You cannot mess up Mommy, these don’t erase.” Thank you Nora for pointing that out. My letters we OK-ish. Drawing on the pumpkins was difficult because of the ridges on them. I decided to draw different patterns on each letter. The B I thought would work to have some polka dots. I was planning to do cute versus spooky. I will add that all pictures from this tutorial is Nora. She took the pictures of this by standing on a dining room chair and directing me. Telling me to move my hand out of the way. Usually I have Dale the the tutorial pictures but he was spending time with the boy’s. It was craft time for my girl and I.
Nora informed me that polka dots were too cute and I needed to make this craft be more scary. Nora asked for more scary so I brought it. In the form of spider webs. I have to say, I think Nora did a great job taking these pictures. The last O I decided to draw some bats. They are another simple silhouette shape that can go with the black and white theme. Gavin and Caleb informed me they look hairy. Bats have hair…. Next is turning this into a banner. I had this burlap that I figured would work great as the backing for this. I cut it down to size and then angle cut the bottom. 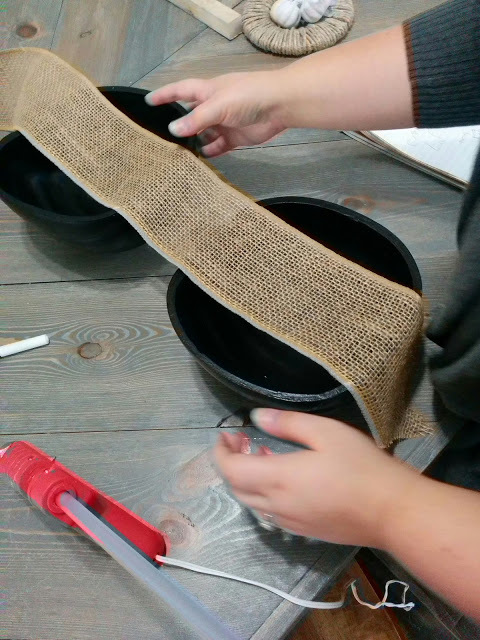 Using my hot glue gun to connect the flat pumpkins to the burlap. 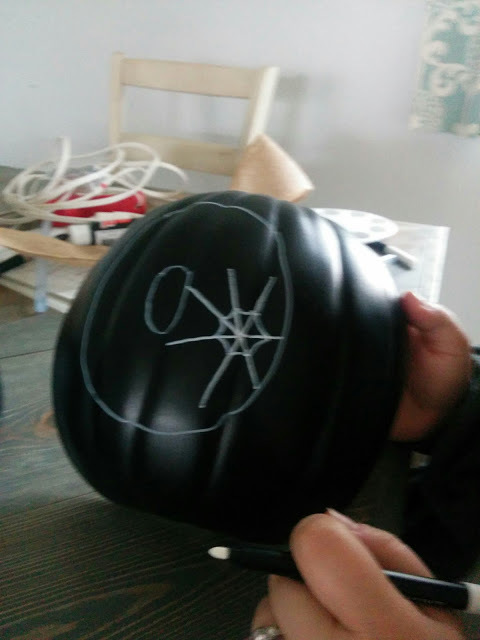 I put a line of hot glue on the portion of the pumpkin that would rest on the burlap. Then push it down tight. 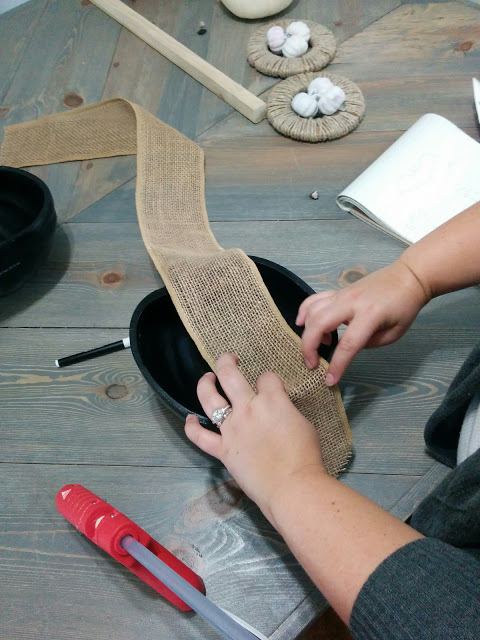 This will help to have no wonky lines and creases in the burlap. 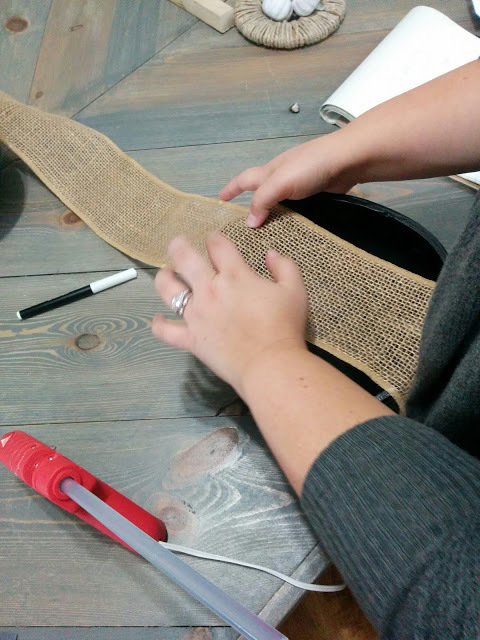 Put the glue on the top of the pumpkin and pull the burlap tight. I did make some marks on the burlap of where I wanted each pumpkin to be. Just so I could make sure the spacing was correct. I am keeping this super simple, really simple. I just draped the excess burlap to the back of this mirror. If you are wanting to nail this to the wall you can either nail it through the burlap, or tying a bow on the top. I made this freestanding mirror. You can find the tutorial here. 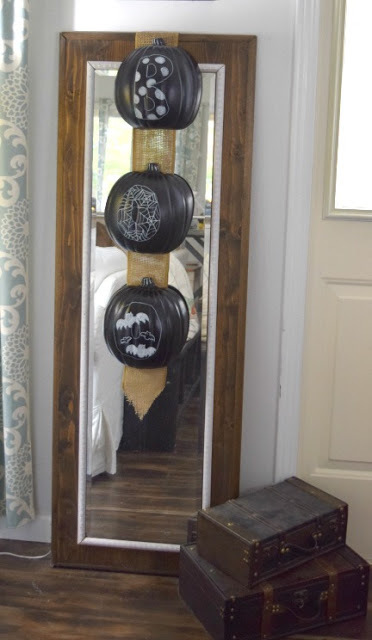 I thought it was fun to put this on the freestanding mirror because mirrors are usually not a place that gets decorated for Halloween. 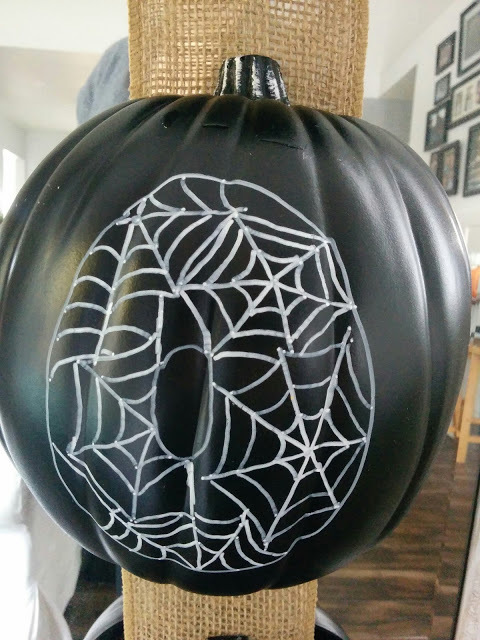 This was my first time drawing spider webs and I am hooked. 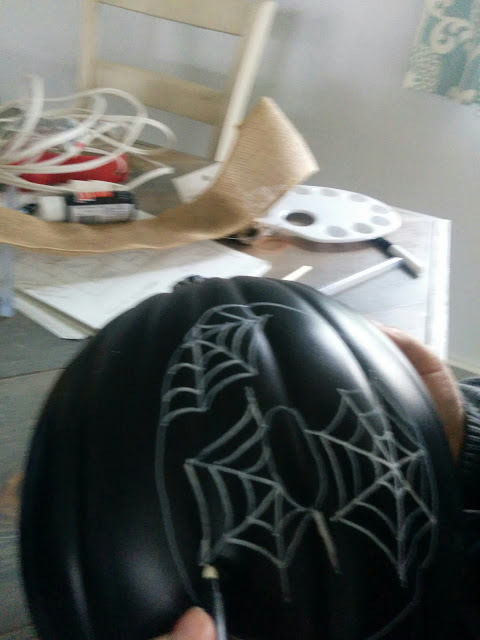 I am sure I will be adding spider webs to a ton of stuff for this Halloween. 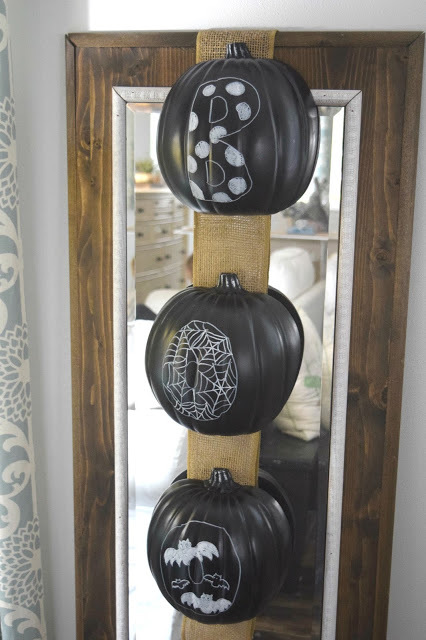 I am loving the stark contrast of the dark pumpkin and then the white patterns on the letters. The rest of my Halloween decor is going up and I am antsy to get it going. October is here and I want to be able to enjoy this fun and spooky holiday. My kids are older, so I can break out the spooky without them being too scared. Granted this is about as spooky as it will get. My kids are still little. We have to keep is fun/spooky. 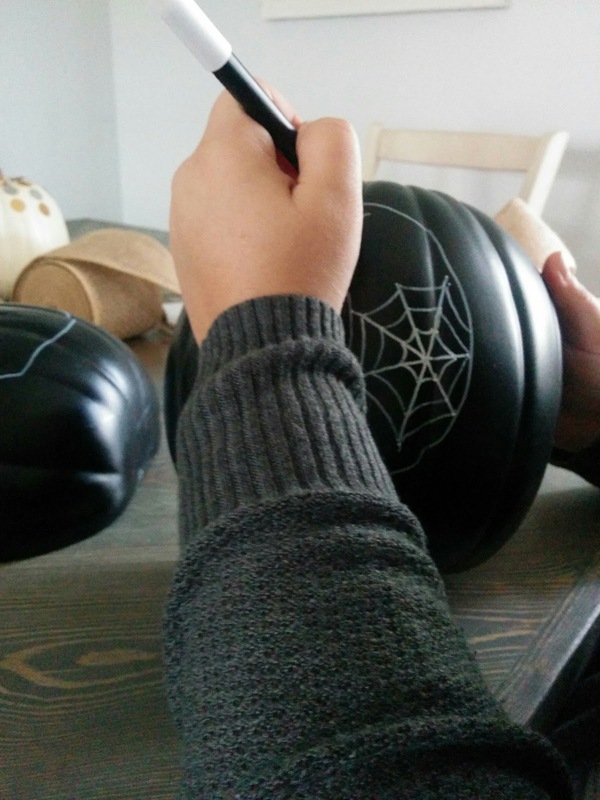 Now, time to visit all of the other great and fun Halloween crafts my friends came up with! Emily, SO cute. 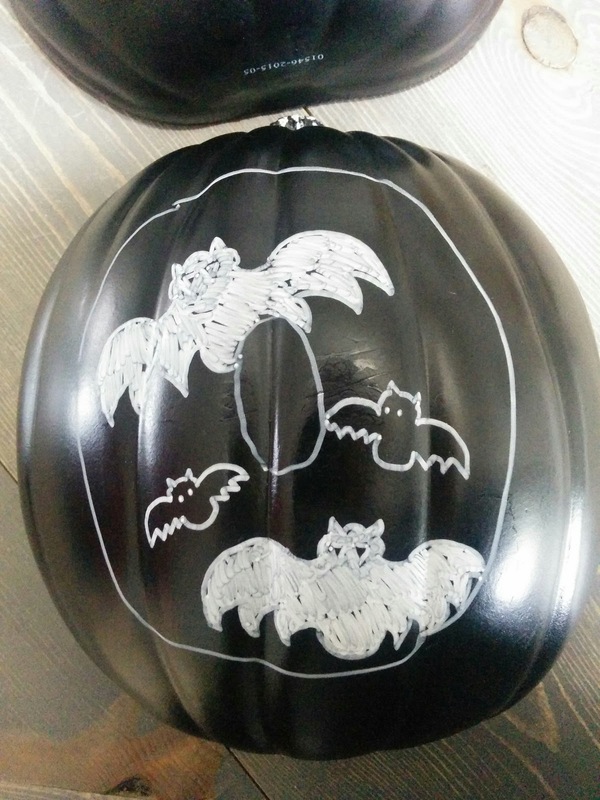 I always see those pumpkins and TRY to come up with something …. LOVE your idea. And, you did a great job free handing girl! LOL at Nora!!! Thank you! I was so worried by going at this with no stencil. It was fun! Such a cute & creative idea, Emily! 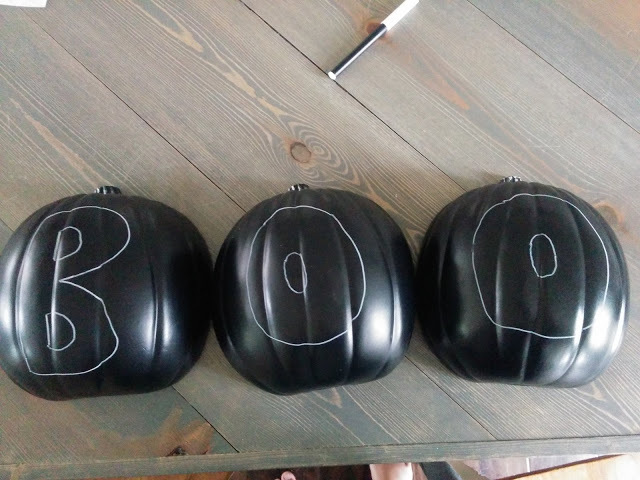 I love how the "half" pumpkins spell our "boo!" Great idea Emily! I've seen those half pumpkins a few places, but I had no idea what to do with them. 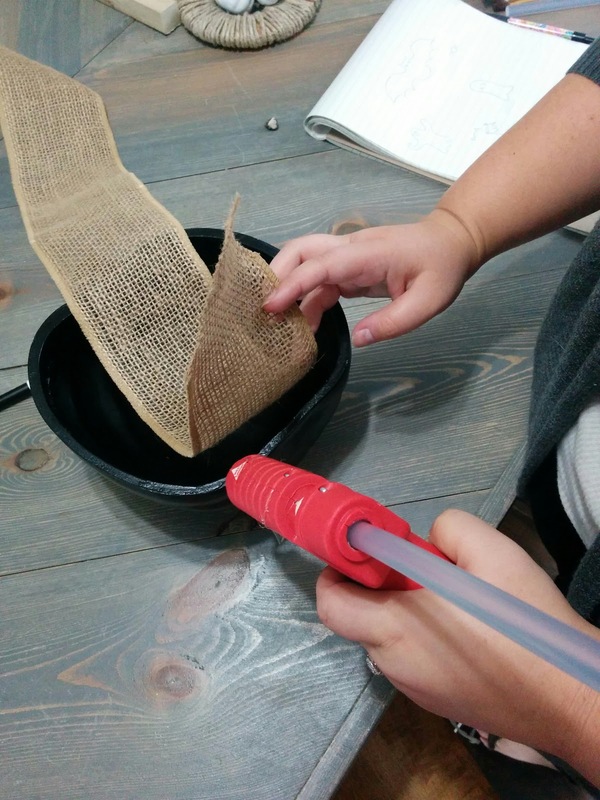 You made the perfect project! Thank you for sharing! I just saw them and did not have a clear plan of action when I purchased them. I knew I could make something fun with them. I love this! My kids love to do crafts with me, and this is a perfect one for us. It would be a great one to do with kids. 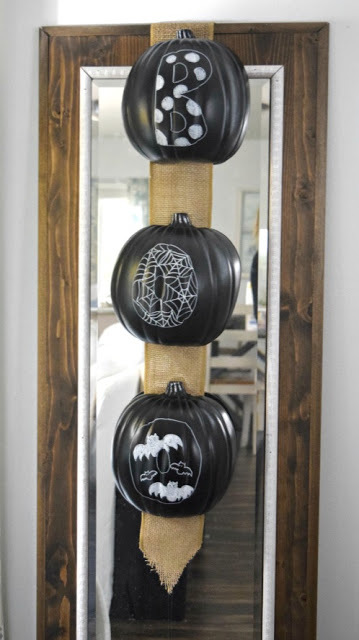 Great craft idea. Thank you for sharing! You made it look so easy! Thank you, it was easy! Just a marker and some glue. It would be fun to do with a child. Very cool Emily! 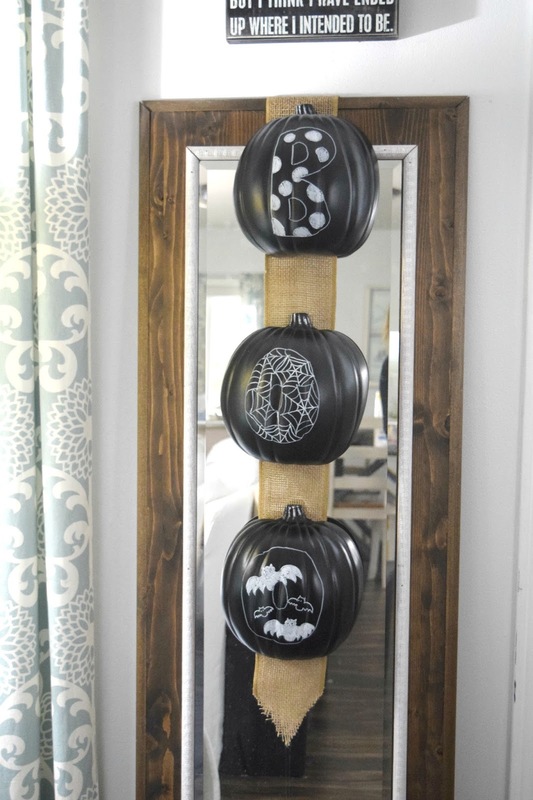 The pumpkins look great on your mirror:). I was wondering if you drew that yourself. Great job!! I too am decorating for Halloween – on my front porch. It's fun! Thank you! Have fun decorating your front porch! This is a cute idea and I love how you created the spider webs. 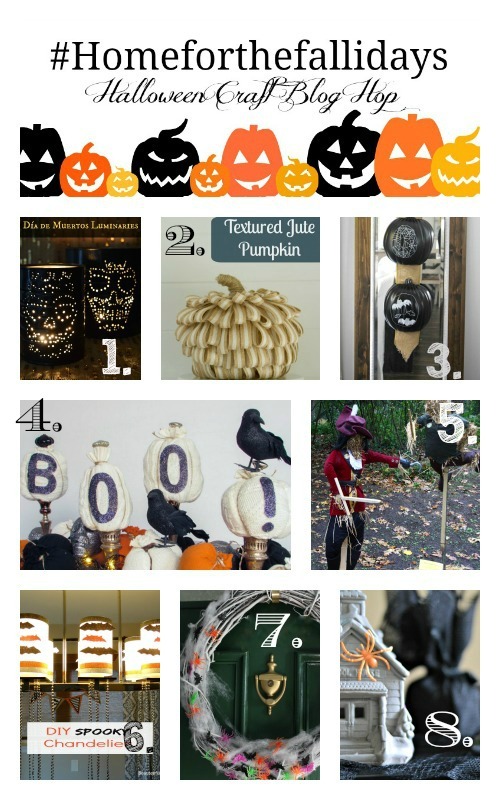 My kids would love to create a wreath like this…one pumpkin per child. Thank you! That is a great idea about letting each child decorate a pumpkin. I love this idea, especially since you could customize the pumpkins for your own decor style. 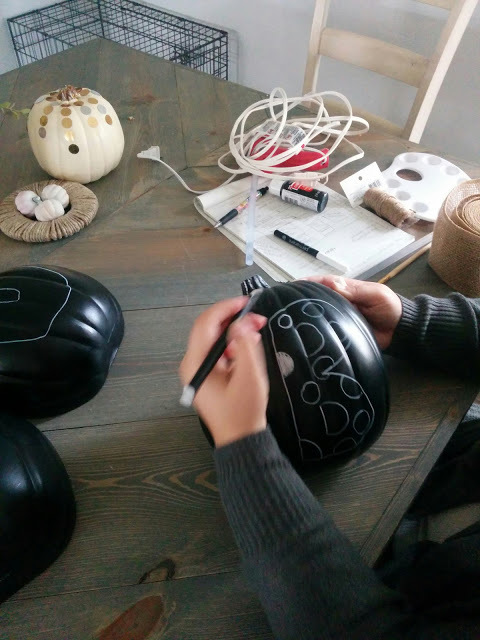 Great project for Halloween! Exactly! 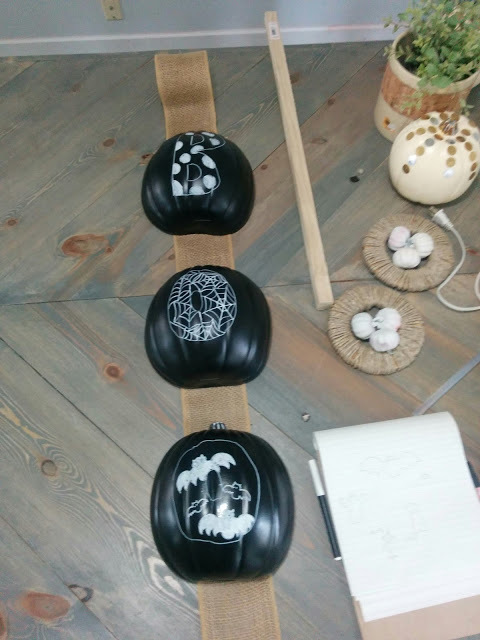 The pumpkins could be painted, anything drawn on them. The possibilities are endless. How fun! I love Halloween. This is a great idea. My daughter tells me we need to decorate more and this looks like something fun we can do together. It would be such a fun project to do with your daughter! I love this! You never cease to amaze me with your craftiness Emily! Pinned and shared! These pumpkins are adorable! I haven't seen the the 1/2 pumpkins, I must go to check them out. Thanks. They are all over the place this season, I am not sure if they were around last year. Any craft store should have them. Emily your so creative! I love what you made with these flat pumpkins. They turned out super cute!!! At first I thought you got pumpkins that were really black, then I read "craft store" LOL! Great craft! 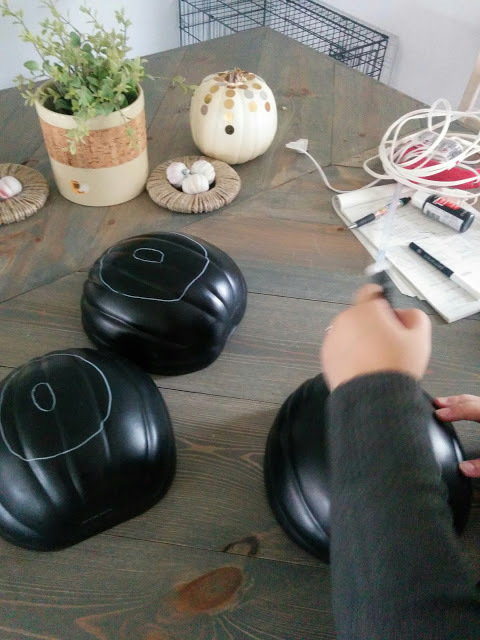 Haha, these are fake pumpkins that are black. It was a fun craft to make! I have to try this for Halloween 🙂 Great idea so creative! Have fun with your craft! I love the way you use colors that complement your home and yet still look seasonal! Thank you so much! I try to make the holidays and specific colors still go with the rest of my home. 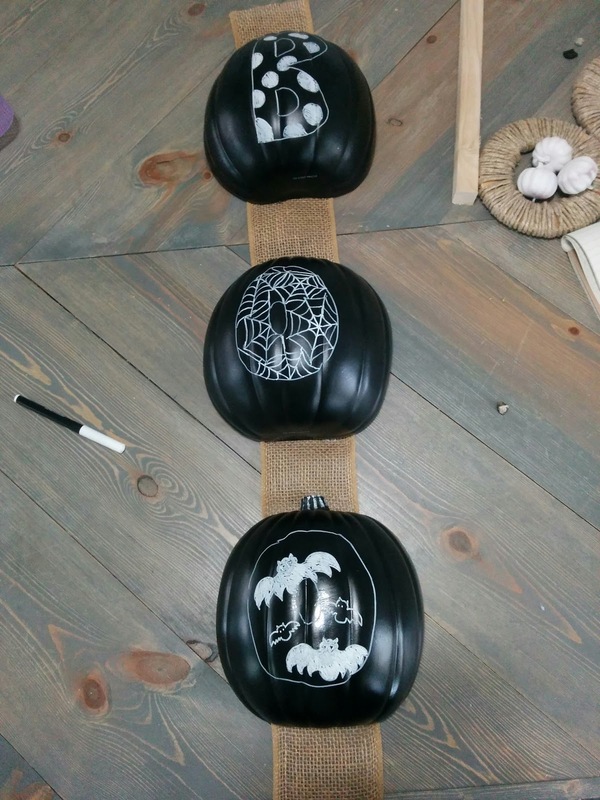 I saw those half pumpkins at the craft store… and walked right past them! I love what you did, and great job to your daughter on her photogarphy! Thank you! Nora did a great job taking the pictures, she is hired as my assistant! These are so cute!! I love them! !